Last summer and fall, we were fortunate to get several visits from my wife’s brother and his girlfriend. They would come through town often en route to various destinations around the country where they could visit national parks, climb, fly fish, and enjoy the outdoors. All of us enjoy their company, but the girls probably enjoy them best. “Uncle Nanno,” as Dan has been called in the past, has an adventurous spirit that the girls absolutely love, and his girlfriend is incredibly patient, loving, and playful with our two daughters, ages four and two. Not to mention, she has a cool dog, Dude, who is gentle despite being “petted” in, what can only be to him, an awkward and unusual way. In addition to their personalities, Uncle Nanno has way cooler toys. 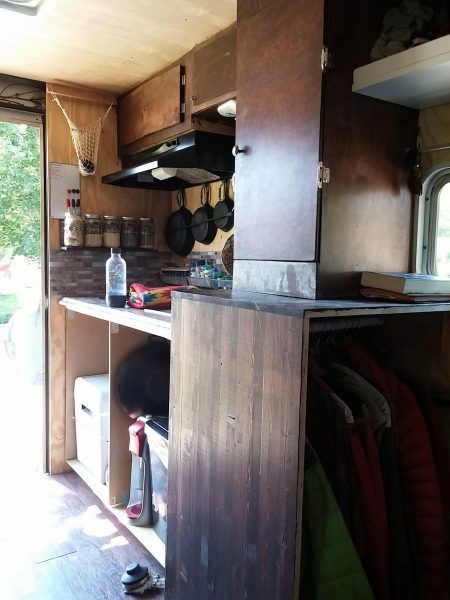 His truck is tricked out, and is the ultimate camping/house on wheels machine, including a kitchenette with running water, a wood burning stove, solar panels, bookshelves, and, of course, a bed and some living space. The climbing and camping gear he has is something the girls rarely see, and they are both intrigued by all of their different usages and of course, want to try them out. If given the chance, they would spend all of their waking hours in the truck, and if ever offered, they would gladly sleep in there too, though they’d be too giddy to get any sleep. In short, when Uncle Nanno comes to visit, in the eyes of my girls, at least, no one else exists. In some ways, as their father, it’s nice to get the small break, and let the girls play with someone whom we know and trust. While discipline is always a challenge, and even more so with such an exciting distraction, the rules are laxed somewhat and it’s understood that mom and dad play second fiddle given the special circumstances and special visitors. However, if the visit is long enough, it can eventually get to the point where being ignored by my daughters starts to feel somewhat frustrating, and even a little hurtful. At many moments in my young career as a parent, I have reflected on how being a father to my children can, in a small way, reflect what it’s like for God to be my Father, and how maybe some of the feelings I have as a father are similar to how God may feel as mine. In the midst of one of our visits from Uncle Nanno, I was able to make this connection again, and began to wonder what it might feel like to God when we, His children, are distracted away from Him, even ignore Him, for something else. This something else could be a relatively good thing, like a relationship with a person or following through passionately on an important cause. Or, it could be less fulfilling things, like a TV show or just plain laziness. It could just be exhaustion from the grind of work, family, and life. Regardless, I’ve noticed in my own life, that my time with God often gets filled with distractions, good and bad, and I find myself sometimes desiring to be with my own “Uncle Nanno” instead of my heavenly Father. And just as I feel frustrated and sad when my daughters’ desire to spend their time with Uncle Nanno instead of me, I wonder if God feels the same way when I choose other things over Him.